In a moment, I’m going to reveal to you a secret. It’s wrapped up in a question. Even if you know the answer to the question – you’ll likely miss the secret. When alive, marketing legend Gary Halbert would occasionally run a class on copywriting and direct sales. You’ll have the answer shortly, but just for fun, let’s see what your real answer is? I won’t see it, but it’ll let you know where you’re at right now. So, many students would say something like; better quality ingredients, or better shop position, better staff, or bigger marketing budget etc. Halbert would reply saying his ONE advantage by itself, would beat ALL of their advantages combined, hands down! Right now, you want to be the host of a PRIME Airbnb property. This really is the simplest, fastest, most practical way to achieve financial freedom through property in 2019! I’m not kidding when I tell you the demand is insatiable. GOOD properties get bookings in days, hours or even just minutes of listing. … And it just goes on and on! THAT my friend, is a starving crowd. Gary Halbert’s #1 desired advantage in business. But so few people know what a good listing is, or how to get these properties with little or no money. 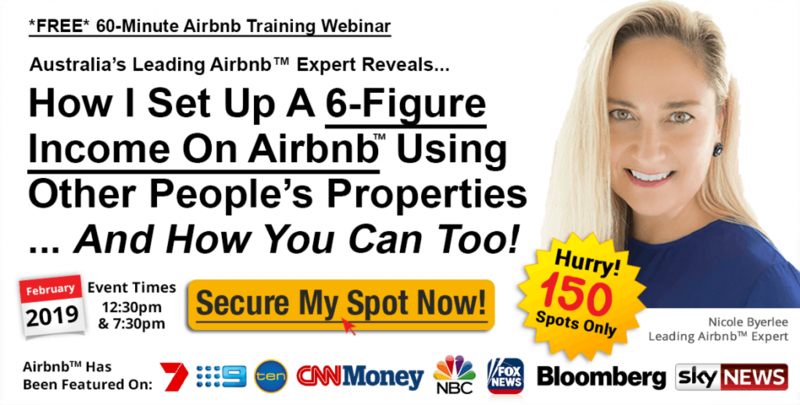 … This is the property business model you NEED to start, IMMEDIATELY!! Now, you thought I forgot about you right? Remember how I said it’s the secret that will change your life, not the answer? The secret is this my friend. It’s not about knowing the answer. In fact, the knowledge is virtually useless to you. It’s about what you DO with it that counts. What action you take. It’s so boring, obvious, (you name it), and guess what, 99% of people still miss it, even when I tell them! If you are into property and haven’t been to see our Airbnb strategy, or already clicked the link above… well, you’re likely to stay right where you are. You see, you’ve got two choices right now. One is to say to yourself, ‘yeah I know the answer’ – then delete this email and go about your day. In which case, nothing changes. The other choice is to click the link below, register for this event, show up and discover how easy it is for almost anyone right now… using property to generate cash, feeding this starving Airbnb crowd. PS. This new property strategy is relatively fast, simple and very low cost to start. Takes just a few hours a day to run. Plus, it’s simple, rewarding and fun. Sign up for this free training RIGHT NOW… and discover how quickly true financial freedom could be yours! !